It’s Thursday morning, 3 days before Christmas, and I’m curled up on my couch watching a Hallmark movie (The Most Wonderful Time of the Year, in case you’d like to join me) but I can’t seem to get my mind off of the posts and recipe ideas that I simply didn’t get to do this year. It’s like a loop of photo ideas, video inspiration, and recipe plans that just never got finished (or even started in some cases). This seems to happen to me every year. The beginning of the season my brain is flooded with ideas to create and share, but in the end, life happens and there are literally only so many hours in the day, and let’s be honest, it’s just me. I don’t have a team of people behind the scenes here helping me brainstorm, develop, and execute ideas. So, while the blog didn’t get populated with as many holiday cocktails, gift guides, and cookie recipes that I had originally planned, this has been one of the most enjoyable Advent seasons that I can remember. We’ve been busy with our Advent Activities, school holiday concerts, day dates with my husband, and bedtime snuggles with the kids. So instead of focusing on the fact that some things didn’t get done, I’m choosing to focus on what I did get done, and possibly share a few not-quite-finished things with you anyway. Because I love you guys and there are a few things that I just really want to share with you. 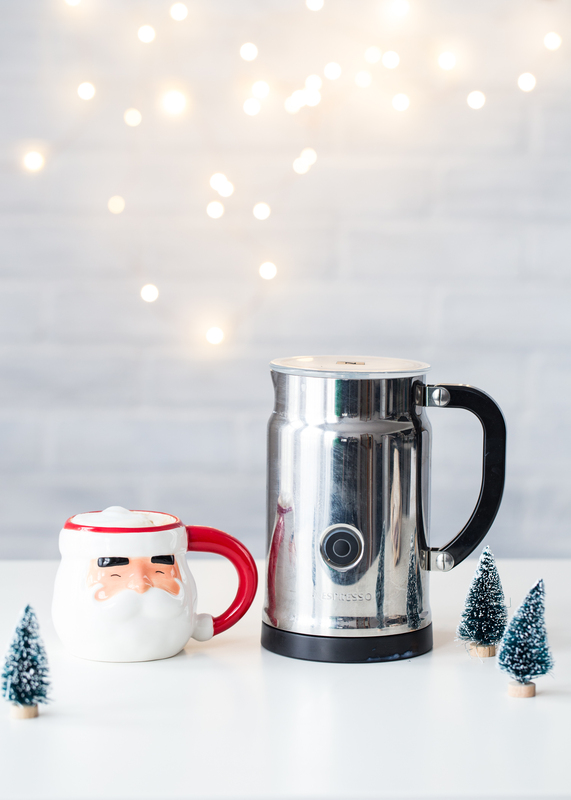 I had planned on creating an awesome video and post full of coffee and cocktail favorites that would double as a stellar gift guide for your coffee obsessed and cocktail loving family and friends (like me!). The video is still sitting half edited in my Final Cut Pro queue, but, I am going to go ahead and share these photos, as well as a few more, under the umbrella of My Favorite Kitchen + Cocktail Stuff for the New Year! Yes, we all need a little freshness to start the New Year. 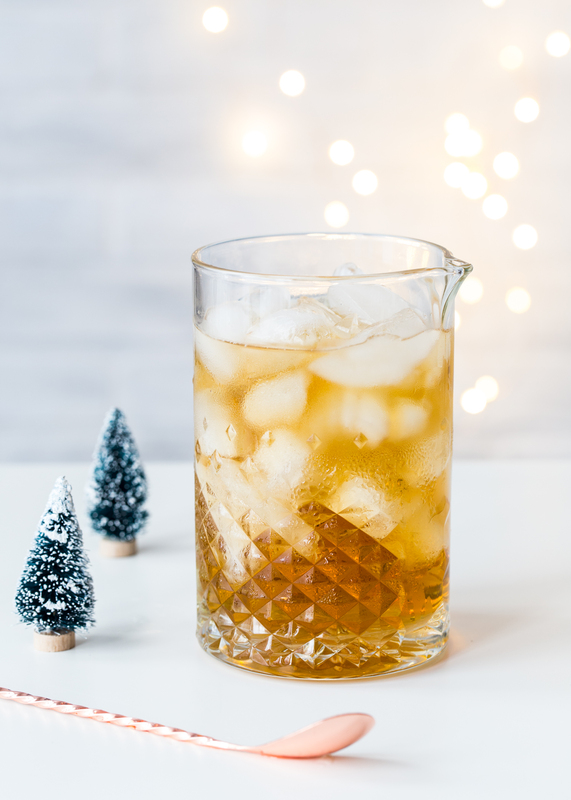 And maybe you are looking for a few last minute gifts for your loved ones or maybe you’re looking to treat yo’ self in the New Year – either way, here is a little round up of some of my very favorite things in the coffee, cocktail, and kitchen world that I’m loving right now. OXO Steel Double Jigger: This was a gift to my husband last Christmas and he absolutely loves it. It has inner measurements for a variety of ounce measures and makes mixing up a cocktail quick and easy. Love this! Mixology Dice by Foodie Dice: If you or someone you know is a cocktail lover, this set is amazing. The set comes with instructions for a variety of cocktail types. You roll the dice and make a cocktail with the ingredients that you rolled. I have had some great cocktails come out of this little set like my rum orange swizzle and my Meyer lemon raspberry fizz. 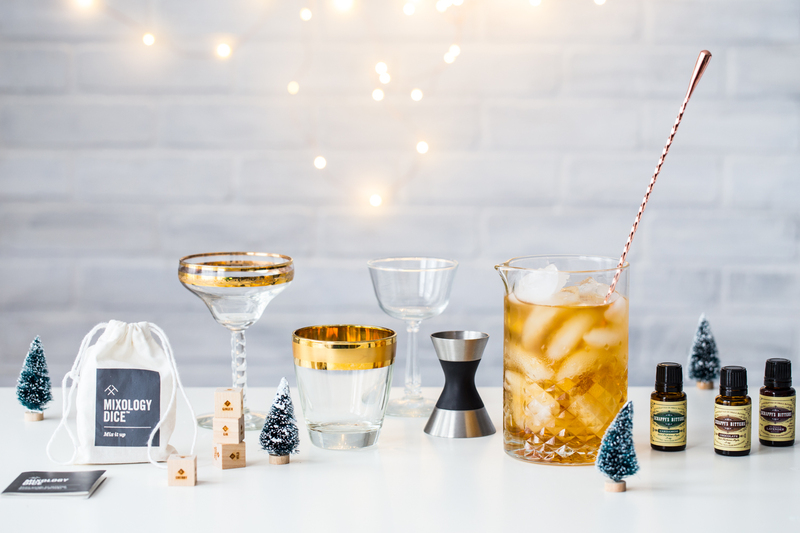 This is a fantastic gift for a cocktail lover and a great way to up your cocktail game in the New Year! Glass Cocktail Pitcher: I found this cocktail pitcher at Target for only $10, which I thought was a steal. Another simple way to up your cocktail game! Copper Cocktail Spoon: If you have a lovely glass cocktail pitcher, you need a great cocktail spoon. Long cocktail spoons are a great addition to any home bar, and who doesn’t love a pop of copper? KitchenAid Burr Grinder with Digital Scale Jar: Every coffee lover needs a great grinder. Buying whole coffee beans and grinding them yourself is one of the keys to a fantastic cup of coffee. 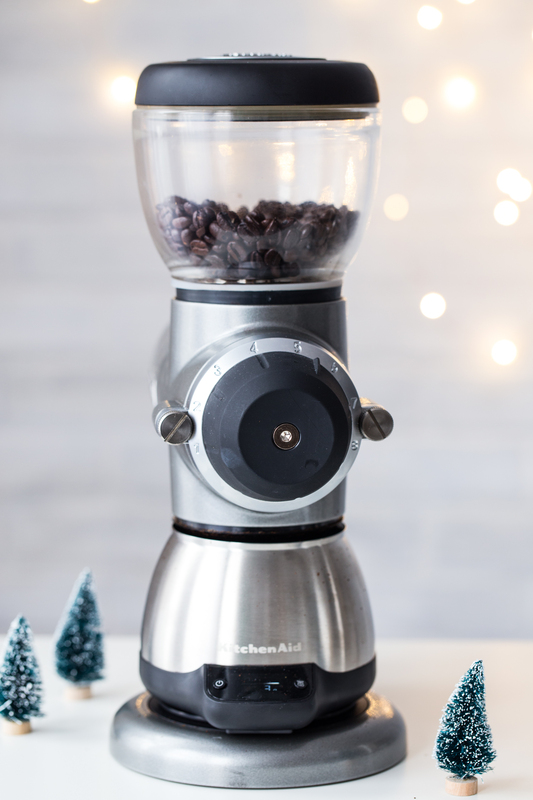 This burr grinder combined with the built in scale jar means perfectly ground coffee and just the right amount of grounds to ensure a perfect cup. I have been obsessed with this grinder for almost a year and use it multiple times daily. It works like a champ and creates very even grounds. The grind size is very adjustable from coarse for a French Press to ultra fine for Espresso. Up your at-home coffee routine with a new grinder in the New Year! Nespresso Aeroccino Plus: This was a Christmas gift to myself last year and I am still loving this little frother! It can steam or froth milk for perfect coffee-house drinks at home. The version on Amazon is possibly the newer version than the one I have, but from the looks of it, but appears to have the same functions. This is one of my favorite coffee making accessories! KitchenAid 3.5 cup mini food chopper: I adore this little food processor!! Because of it’s small size, it cleans up easily, doesn’t take up an insane amount of room in my cabinet, and is just a great way to process up ingredients for dinner. 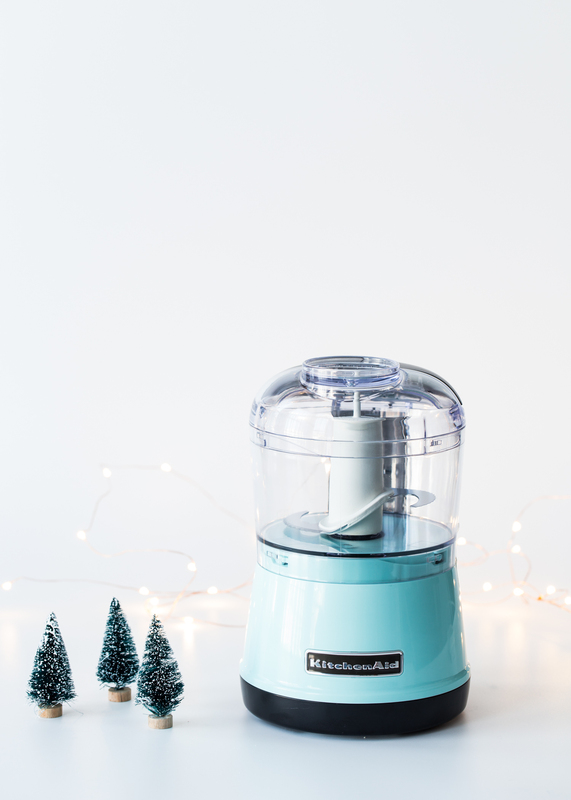 My more baking-obsessed friends have said that it works wonders for grinding up cookies, nuts, and other ingredients for baked treats. The version that I have is actually the older model (are you sensing a theme here) and is discontinued, but still available on Amazon. The new version is very similar but the styling is changed a bit and is offered in different colors. You can find the new version here. Vintage Glassware: Ok, I have no links to share with you for this. Vintages glasses are a passion of mine (as seen here and here and here) and I am just thoroughly obsessed with finding beautiful, unique glasses from a time gone by. 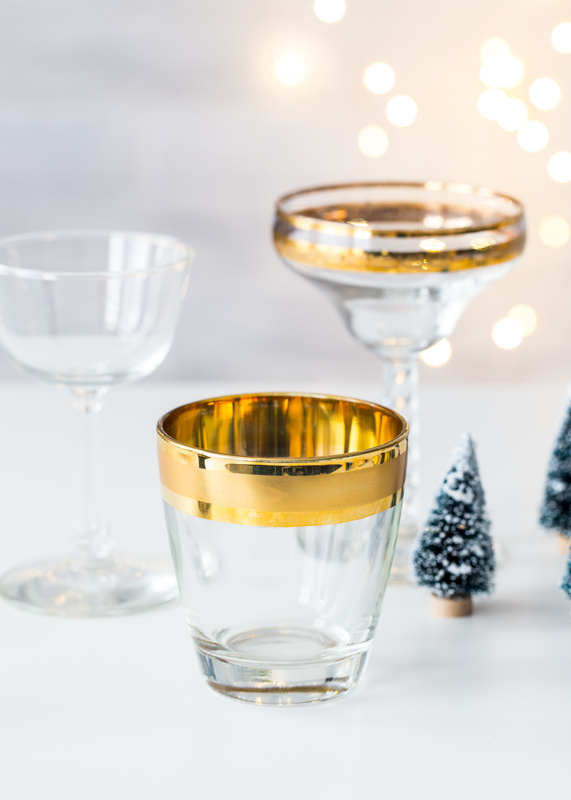 If you love cocktailing or know someone who does, finding a few unique glasses is a fun way to mix up your cocktail hour. Some of my favorite places to find vintage glasses are antique stores, Goodwill Stores, Savers, and even Etsy. Plus, the search is half of the fun! Pie Calendar: I just love this sweet calendar! 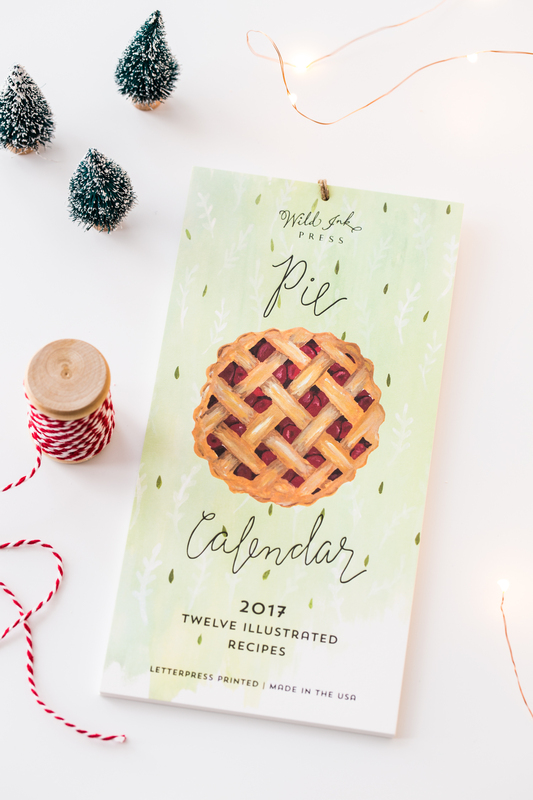 Elise from Simply Recipes teamed up with Wild Ink Press to design a 2017 Calendar featuring some of Elise’s best pie recipes. Each month features a recipe with custom illustration that could not be more adorable. If you are a pie lover/baker and want a little artwork in your life, check out this calendar. It’s just too sweet! 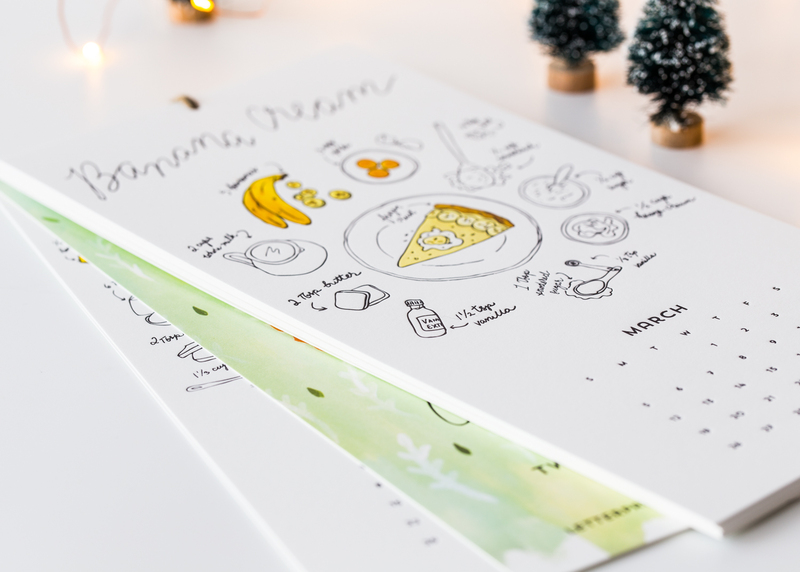 Nourished Planner: I couldn’t put together a post about my Favorite Kitchen + Cocktail Stuff for the New Year without including a great way to stay organized. 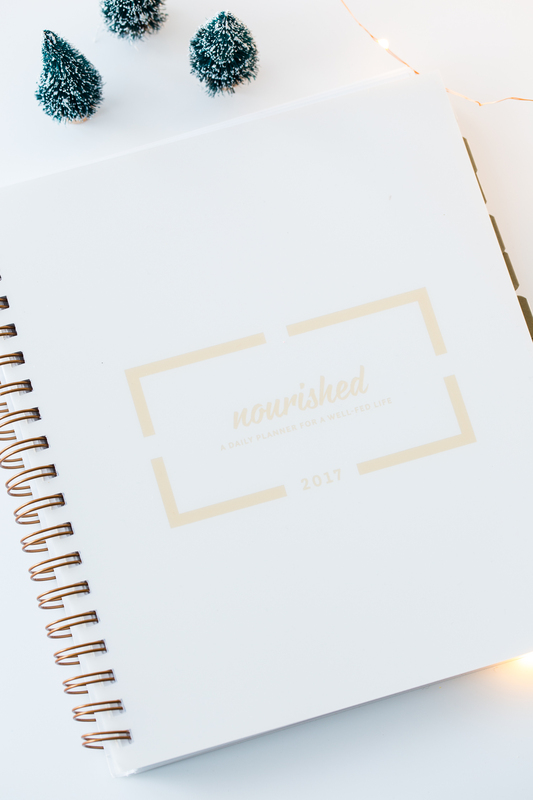 The Nourished Planner is a new meal planning, life organizing planner that is designed to help keep your life in order in the new year. 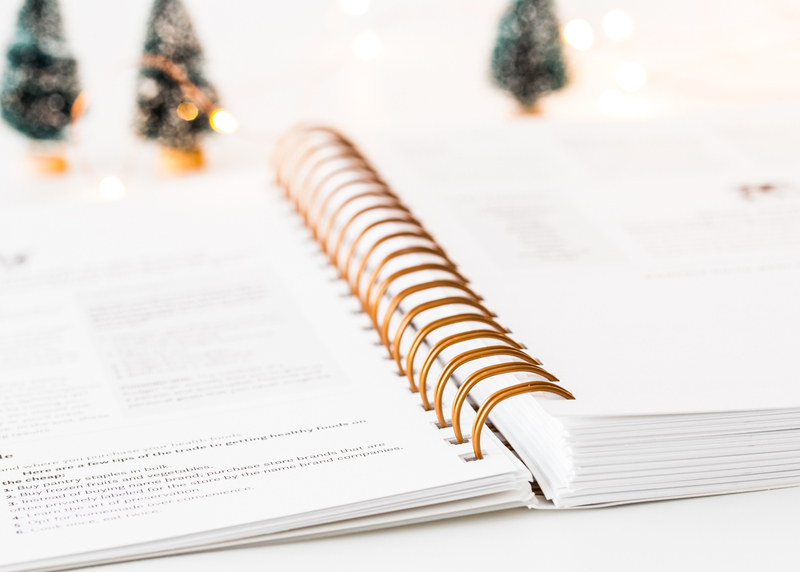 From personal health goals, to family meal planning, this planner is an all encompassing journal that I’m sure will help me keep on track in the New Year. I can’t wait to get started in this! I am so grateful for you and I truly hope you have a fantastic and blessed Holiday Season! I am looking forward to sharing new ideas with you in the New Year. Disclaimer: Some of these links contain affiliate links. I have purchased all of these products on my own with the exception of the KitchenAid Burr Grinder and Digital Scale Jar which were sent to me as a part of a previous blog post that I created for their website, as well as the Pie Calendar which was sent to me by Simply Recipes for my review and consideration. This post is not sponsored in any way. These are all products that I love and stand by. Thanks so much for sharing the pie calendar Emily! I love all of your other gift suggestions too. Happy Holidays! I’m so happy to have had the chance to try it out and share it, Elise! Thank you again and Happy Holidays!! You have done a great!! Your Recipe idea and Christmas plan is very good. Thanks so much, Sheuly! Happy Holidays! I got that cocktail pitcher for my birthday this fall and I LOVE it! I’m so excited to see that the calendar is out from Elise. It’s so cute! Such great ideas. Love this!! That cocktail pitcher is stunning!! 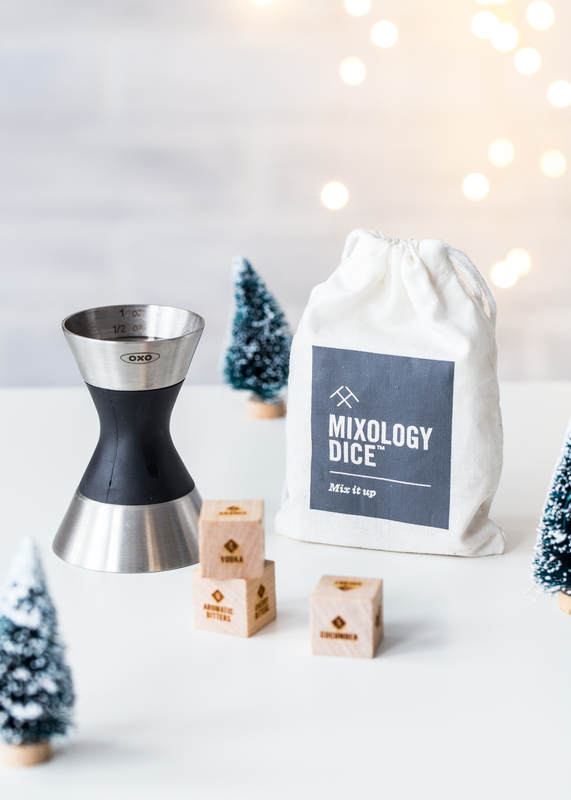 i feel like i need the mixology dice in my life ASAP. Thanks, Rachael! Yes, scour all of the shops you can find for antique glasses and keep your eyes peeled! You never know where you’ll find some. I have had to really look past some layers of dust to find some of my favorites 🙂 If you love cocktails, def check out the mixology dice! They also have food/cooking ones which are fun, but these are my favorites by far <3 xoxo Happy New Year! !